How to connect your netool’s ethernet interface directly to a 802.1q tagged VLAN. All Layer 3 tests will run on the manually connected tagged VLAN. Test for DHCP on a tagged VLAN. Route devices connected to the netool’s built in access point to the subnet located on the set tagged VLAN. This allows connectivity with your smart device to the tagged VLANs network. More info about 802.1q at Wikipedia. Firmware build 59 and above. iOS or Android app 1.8 and above. Step 1: Tap the settings icon (sprocket) and once on the settings menu tap Ethernet Port. 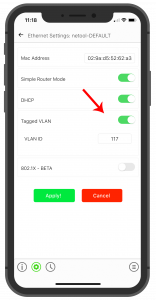 Step 2: Enable Tagged VLAN via the toggle switch, then enter the VLAN id of the VLAN you would like to connect to. 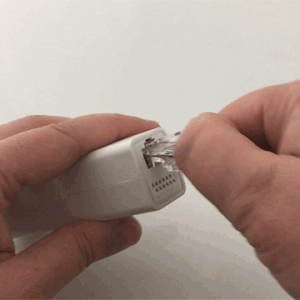 Step 3: Unplug your ethernet cable then plug it back in to rerun your tests. Step 4: Happy Tagged VLAN testing. Don’t forget to subscribe to our news letter to stay up to date! Leave a review and let the world know what you think of our work so far. Need help with a resolution? Resolution Center has common solutions.